Designed for twice the versatility, the new Concert 277 offers an additional channel and a second professional microphone, increasing your vocal applications by two-fold. 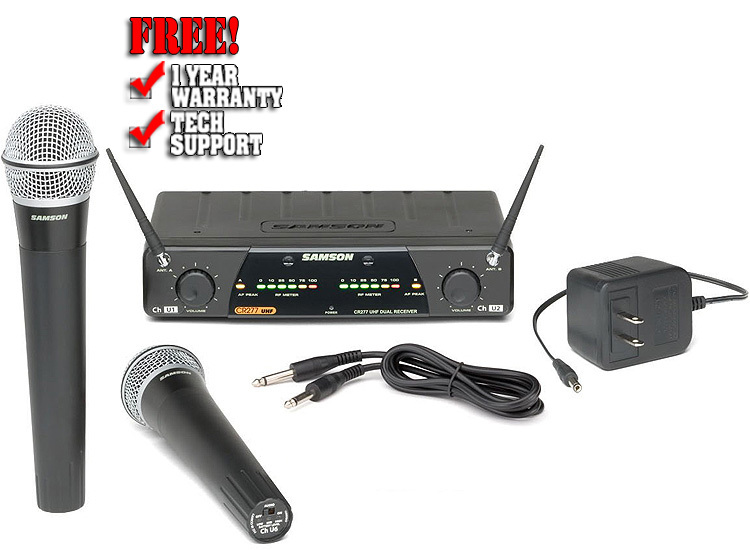 The Concert 277 is a dual channel true diversity UHF wireless system that offers a professional wireless solution for varying vocal applications. We took our incredibly popular Concert 77 series and expanded the flexibility of the handheld configuration to accommodate two separate channels and included two HT7 handheld transmitters. The beauty of the CR277: You can have both channels and transmitters running simultaneously. That means it's ideal for karaoke MCs, bands with multiple vocalists, two DJs at the same event or several presenters at one affair. Plus, with the same reliability and crystal clear operation that's built into every Samson wireless system, you can be sure you're getting exceptional audio reproduction and the most dependable performance available. Featuring a Q7 dynamic microphone capsule, the HT7 provides a high level of accuracy and audio performance thanks to its low mass, neodymium element. The HT7 also employs a tight supercardioid pickup pattern to reduce feedback and effectively reject signals not originating directly in front of the mic capsule. The CR277 true diversity half-rack UHF receiver is at the core of the system. Synthesized PLL frequency control circuitry keeps the signal locked while dual tuned antennas with LEDs monitor the true diversity operation. The receiver also features a front panel display with large multi-segment RF level LED meters and two large rotary volume knobs, one for each channel. Its rear panel features balanced XLR and unbalanced 1/4-inch outputs allowing flexible connection options. Thanks to meticulous engineering, state of the art technology and impressive audio capabilities, the CR277 is perfect for any wireless scenario where two voices are better than one.